Three dimensional TV are now widely on sale and some of the viewers could have enjoyed stereoscopic scenes of the soccer world cup games. This sophisticated technology plays an important role not only in the entertainment buisiness but also in the medical industry. Let me explain how this technology is combined with robotic technology to enable the so-called robotic tele-surgery. When a patient requires an immediate and difficult operation, the operation can be done by this new technology. The patient images taken by the 3-D camera are transmitted to the surgeon sitting before 2robotic arms in which the movements are duplicated by the robotic arms near the patient. 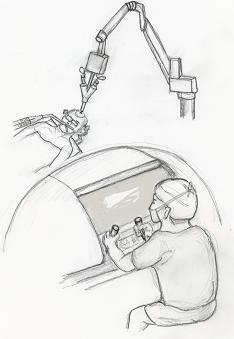 The surgeon maneuvers the robotic arms into the 3-D image of the patient's lesion , cuts,exterpates and stiching are performed by the other robotic arms before the patient. In this way, this new technology will bring a great boon to the patients living in a remote place where the latest medical services are not easy to access. This technology requires us surgeons to have not only good vision in both eyes but also good binocular vision so that we can perform exact surgical procedures on 3-D images of patients.